Built in 1894, the red brick structure was originally a workers’ tenement. In 1929, Pittsburgh’s Harvard, Yale, and Princeton Clubs banded together to find a home, and Pittsburgh architect Edward Lee, a Harvard graduate, was commissioned to transform the space into a private club. The exterior was then remodeled in the Georgian style to be reminiscent of old London. During your visit, you will have the opportunity to experience this longstanding, private social club first-hand. 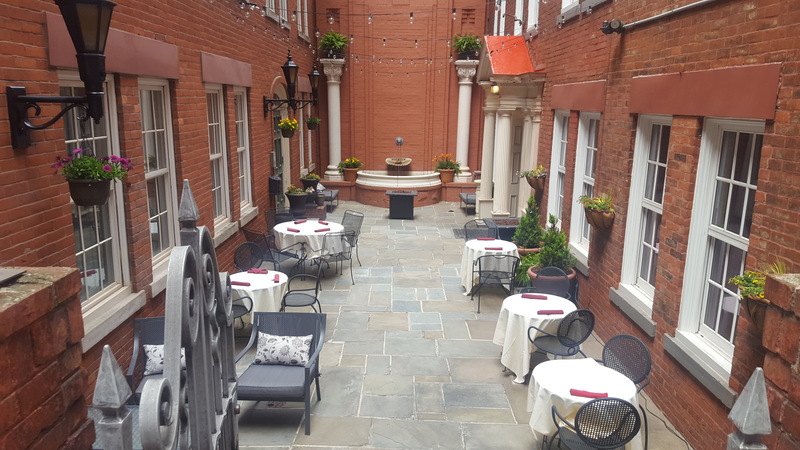 After walking through the London-inspired courtyard, you will be invited into the lounge, to enjoy the comfortable setting, complete with cozy couches, original photos and a Latin toast carved in the wooden bar. You will also see the dining room, where the walls are graced with the names of U.S. Presidents who have graduated from Harvard, Yale or Princeton. Beverages and Food prepared by our Executive Chef will be available for purchase. Built in 1894, the buildings originally contained 12 three-room apartments and served as worker’s row houses. Alumni of Harvard, Yale and Princeton had been active in western Pennsylvania for many years, but none of these individual groups were large enough to maintain their own club space. However in 1929, Pittsburgh architect Edward B. Lee, was commissioned to transform the apartments into a joint club. The club opened its doors on November 7, 1930. The Allegheny HYP Club today is the cumulative merger of three premier city clubs that helped shape Pittsburgh: The Harvard Yale Princeton Club, The Pittsburgh Club (merged 1997), and The Allegheny Club (merged 2002). For over 85 years, the Club’s members who include leaders of business, finance, education, government, medicine, the legal community and the arts, have cherished the Club due to the personal attention and exceptional service they receive. Surrounded by elegant furnishings and works of art in an historic venue, members and their guests enjoy fine dining, social events, private conferences, event facilities, and concierge service.